This cooler is equipped with a completely unique high quality system with a quiet built in compressor comprising a damper and molecule suction air filter. • This cooler has a continuous cooling performance of 5.3-6.6 Gallon/h., max. 8 Gallon/h. • The modern compressor cooling unit uses the power input for direct transfer to chilling, which guarantees minimum energy usage. 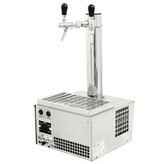 • The best chilled beer will be ready in the thermal block within 2-4 minutes after the cooler has been switched on. • The cooling technology is 45% more efficient than its electric energy input. • The complete external construction is made from stainless steel to give a more clean and aesthetic look. • This machine also includes a stainless steel drip tray and an adjustable temperature control with 7 different settings. 38F-50F. • PYGMY coolers have been recognized by experts as the beer coolers with the best ratio of price/performance/ quality/ dimension.